Its never been a better time in history then to be your own boss. There are so many ways that you can turn your passion into profit. Whether your an artist or a foodie you can start a business from your kitchen table. One of the largest ways many people get started in home based business is through Network Marketing. The business model is exactly in the name. Through your existing network of friends and family you share products, goods or services. In Network Marketing you get started in a partnership with a company and you become a distributor/representative. The company has a compensation plan that allows you to earn more money when you build a team of other distributors/representatives like yourself. Because of the recent global economic downturn, more and more people have turned to Network Marketing. More people are realizing that there is no "true job security". Over the years network marketing has develop a stigma that its not a legitimate industry. That it's a bunch of schemes and scams. Even in this bad light people still are attracted to it. Truth is like in any other industry there are people who misuse and abuse this business model and take advantage of people. But the industry as a whole is a very reputable. 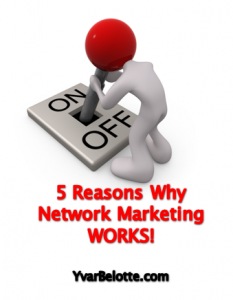 Here are the top 5 compelling reasons why network marketing is the perfect starter home business. The industry has been around for 70+ years. There have been more millionaires created from this industry than any other. Over 90 million have taken part of Network Marketing globally. Tens of millions of people have consumed and used products from this industry. Enough said! You must wise up to the fact that your retirement in solely in your hands. Working 40 hours per week for 40 years and then only retire with 40% of your income will only give your stress and worry in your golden years. There is nothing wrong with jobs. They are a necessity when starting out a new business venture. That's why this industry has been a perfect fit for those transitioning out of the work force. As I mentioned before network marketing is a partnership between you and a company. The company creates the product, does the research and development, establishes a market for product, designs the website, creates promotional material. Essentially it does the bulk of the heavy lifting. As Distributor/Representative, for a small fee, you are able to promote, market and sell the product as if you created. You avoid a lot of risk this way. Most adults never get a chance to flex their leadership muscles. Network Marketing is all about developing you as a leader because you will be building a team/organization which will require certain skill-sets. Learning from top industry leaders on how to manage yourself and your growing team as well as how to avoid painful pitfalls. Getting a customer base in your home business is very important because it will give you residual income or reoccurring income. You benefit over and over again after one 1 transaction. Essentially when your new customer purchases your product or service and likes it so much that they re-order month after month, you get paid month after month. Now just think about 500-1000 customers on a monthly bases purchasing from you. The sky is the limit. Now as much as this industry has changed countless lives there is big fat pink elephant in the room I've got to address and that the huge failure rate of 97%. That means only 3% of those who get started in this industry go on to gain success in their home business. What is it that they know that the rest don't? Truth is the 3%ers follow a formula of success. They follow a proven system, they leverage results and position themselves as leaders by training and educating. You must release the employee mindset and adapt the entrepreneurial mindset. Entrepreneurs are problem solvers. You must learn how to position your products or services as a value-add to your customers. Anything less will be considered a scheme or hype. The reason why network marketing offers an easy entry into the industry is to attract the masses but it is hard work. The concept is simple to understand but people fail to understand that they must improve their skills as a Networker. Improving your communication is the key to making it big in this industry because delivery of information is everything. That's why marketing training and education is critical to your success. If you are still asking yourself Why Network Marketing? Why Not! All systems go now Poh! Thanks! I Agree with you! Love this post so much, Network Marketing is Amazing indeed!! Appreciate your kind words Tara!! Awesome read. Thanks for sharing. One thing I like about network marketing is the thing we call LEVERAGE. Its just great to be at home and have time freedom. Fantastic post Yvar! I believe this industry will become much more valued with time. Great post thanks for sharing.